You can create a playlist with the Groove Music app to play your favorite songs — songs from different artists — one after the other. After you create the list, you select it in the Groove Music app to play it. To create a playlist in the Groove Music app, select the Create New Playlist button (a plus sign). You see the Name This Playlist dialog box, shown here. Enter a descriptive name for your playlist and select Save. Add a song: Select a song’s Add To button and select a playlist on the pop-up menu that appears. Add all the songs on an album: Select the Add To button below the album name and select a playlist on the pop-up menu. To play the songs on a playlist, select the name of the playlist on the left side of the screen. The playlist opens, as shown. 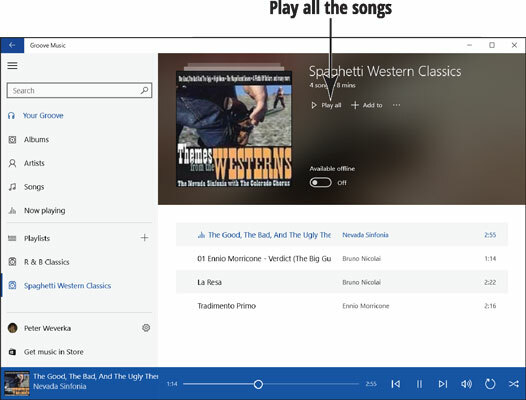 Select the Play All button to play the songs in order from first to last. Of course, you can select any song on the list and select its Play button to play it. Change the order of songs: Drag a song higher or lower on the list with your mouse or finger. 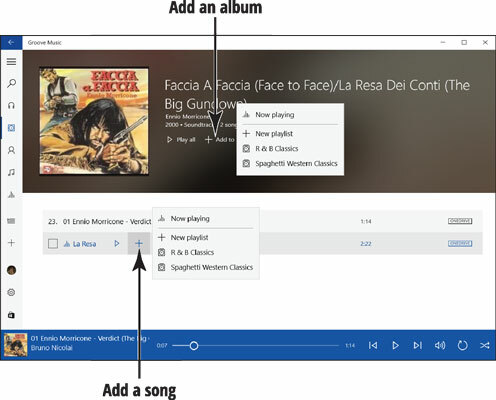 Remove a song: Display the song’s context menu and choose Delete from Playlist. To display the context menu, right-click its name with your mouse or hold your finger on the name. Select the Cancel button when you finish rearranging the playlist. To delete a playlist, open it. Then select the More button and select Delete on the pop-up menu.